DENVER (AP) The Phoenix Suns didn’t get to Denver until around 2 p.m. Wednesday because of plane trouble. Harris tied his career high for points, finishing 14 of 17 from the field. Nikola Jokic added 14 points, nine rebounds and eight assists to help the Nuggets stop a two-game slide and improve to 13-4 at home this season. Wilson Chandler added 17 points, Trey Lyles had 16 and Jamal Murray 13. Denver used a 37-18 third quarter to take control. Devin Booker led Phoenix with 17 points. Greg Monroe filled in for starting center Tyson Chandler and had 16 points and 10 rebounds. Marquese Chriss added 16 points, Josh Jackson scored 14 and TJ Warren had 13. The Suns had some issues getting to Denver after their 104-103 comeback victory over the Atlanta Hawks in Phoenix on Tuesday night. Waiting at Sky Harbor International Airport until 2 a.m., the Suns were finally sent home as mechanical problems delayed their flight until noon. Harris hit his first eight shots and finished the opening quarter 9 of 10 from the field. He had 20 points in the first 10:34, including a nifty reverse layup that fooled two defenders. 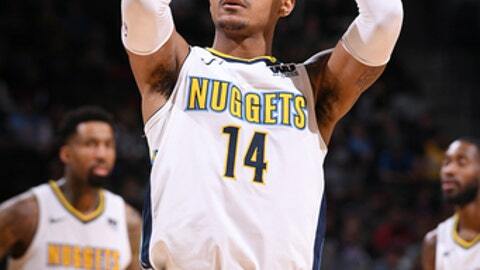 His driving layup late in the quarter put the Nuggets up 34-22. The Suns responded, though, outscoring Denver 45-27 in the final 13:09 of the half. They shot 16 of 21 from the field in the second and led 67-61 at the break. Denver took over after that, as the Suns hit only five of their first 28 shots in the third. Suns: Chandler (rest) sat out, while Monroe got the start for his first game action since Dec. 21. … Jackson, the Suns’ first-round draft pick, logged 24 minutes after not playing for the first time this season Tuesday. Nuggets: Monroe blocked Warren at the basket in the final seconds of the first half and Jokic picked it up and heaved a full-court pass to Harris, who tapped in a layup at the buzzer. Harris finished the half 12 of 13 from the field. … SG Will Barton played despite illness and had 12 points. … PF Juancho Hernangomez (coach’s decision) missed his fourth straight game. The 22-year-old Spaniard has logged only 3 minutes of playing time in the team’s last nine games. … Broncos general manager John Elway sat courtside. … PF Kenneth Faried had four points and two rebounds in his first action since Dec. 15. With Elway in the house, Jokic showed off an electric passing game of his own. Off a Phoenix turnover late in the third, Jokic flipped a behind-the-back pass down the court to Malik Beasley, who finished it with a wide-open slam. The two also connected on a few other highlight-reel breaks in the half. After a 41-point second quarter, the Suns scored only 44 the rest of the way. Suns: At San Antonio on Friday night. Nuggets: Host Utah on Friday night.